A few months ago, I visited Scottsdale, Arizona during the National Alopecia Areata Foundation’s Annual Conference. 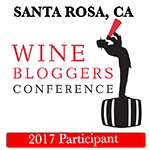 Typically when I travel, my trips become more about the food and wine available at my destination than the main reason for the trip, so I do more research on places to eat/drink than I do on anything else! Since my hotel room at the Gainey Suites Hotel was equipped with a full kitchen, I planned to get groceries and make my own dinner for the first evening. Then on the second evening of my stay, I would dine out. Since I had never been to Scottsdale before, this would require some web surfing on some of my trusted travel sites. I stumbled upon Starlite BBQ and Whiskey Bar after only searching for a few moments. 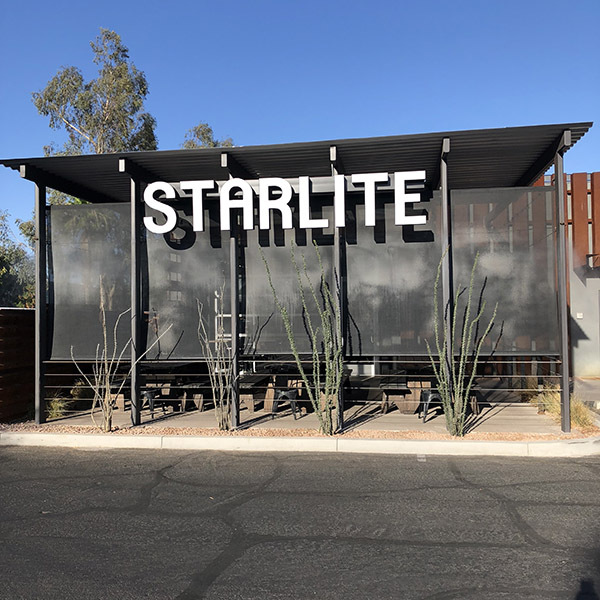 Since opening last year, Starlite BBQ has been named one of the Seven Metro Phoenix Restaurants you Need to Try Right Now by the Phoenix New Times, as well as one of the 11 Best New Restaurants in Phoenix, Arizona (area) by Eater.com. Starlite BBQ was also selected as an 2018 OpenTable Diners’ Choice Winner. This would be the place for Friday night’s dinner for sure! So on Friday evening, after a short Uber ride, I ended up in a shopping center where Starlite BBQ resides. It sits prominently on the edge of the center, complete a facade decked out with hip white font lettering that can’t be missed. There is an outdoor seating area, but during my visit it was over 100 degrees, so I opted to sit inside and people watch as the filled up the place for dinner. 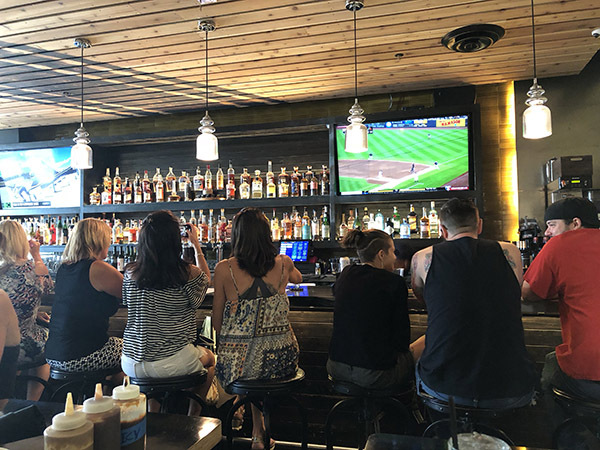 I sat at a small table against the wall, facing an already lively bar scene and two televisions broadcasting different sporting events–one of them a Diamondbacks game. Across from me on the table was a selection of house-made sauces. I was eager to try them all, but stopped short of squirting the bottles directly into my mouth. First, I selected a beverage to nurse while I contemplated what to eat. Prosecco was the perfect drink for an opening act. Starlite also has a specialty cocktail menu featuring many whiskey-based drinks, as well as four rotating handles of beer on draft, an ample selection of bottled and canned beer, and a nice list of wines available by the glass or bottle. 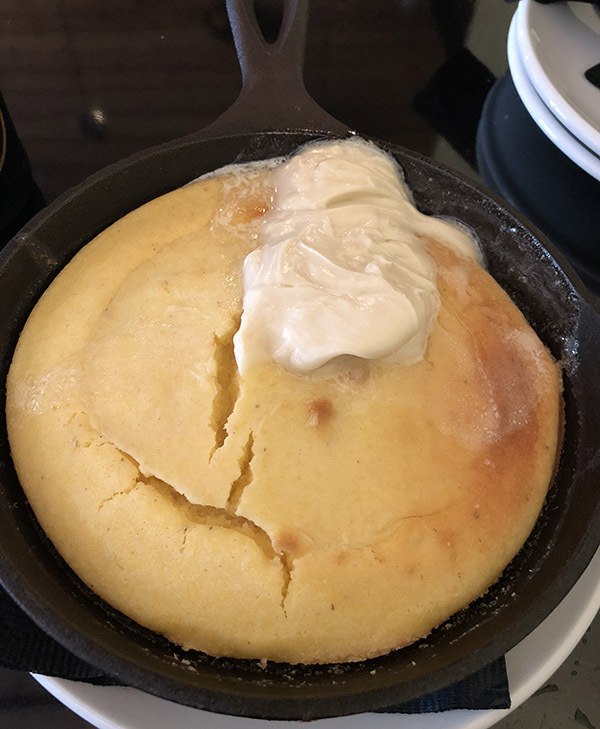 While I was selecting my entree, this skillet of cornbread topped with an enormous dollop of melty honey butter appeared on my table. Now this is something I don’t normally eat, but it was really calling my name. The cornbread was still warm, both sweet and savory, and I still remember its delightful texture (just enough crumb without being too dry) even three months later! I’m not exaggerating when I said it was one of the best cornbreads I have ever had. 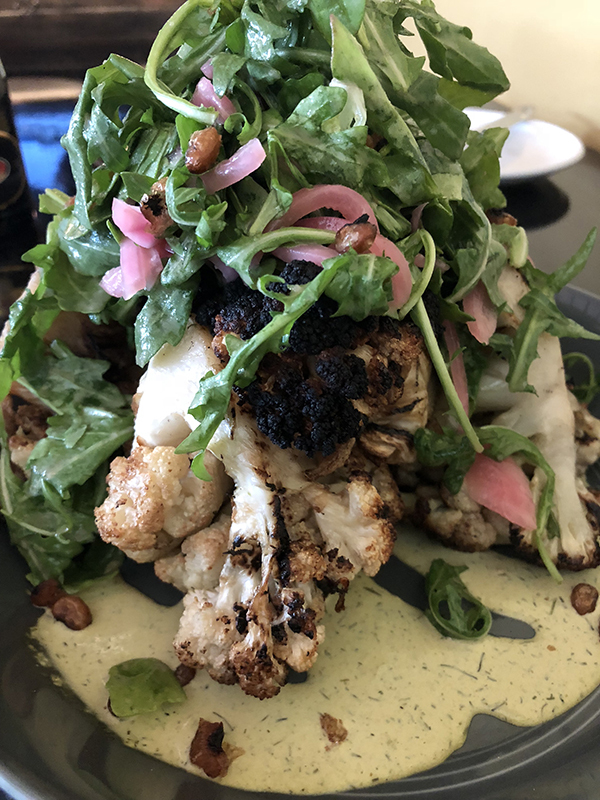 The Grilled Cauliflower (with Green Goddess, Crispy Black Eyed Peas, Arugula, Pickled Onions) dish really caught my eye (I saw it served to another table as I was about to order), so I snagged one for myself. The dish’s flavor was expertly balanced by the sweet and sour of the dressing (and just enough of it without making the dish soggy), the char on the cauliflower, the crunchy texture of the black eye peas and the peppery arugula. 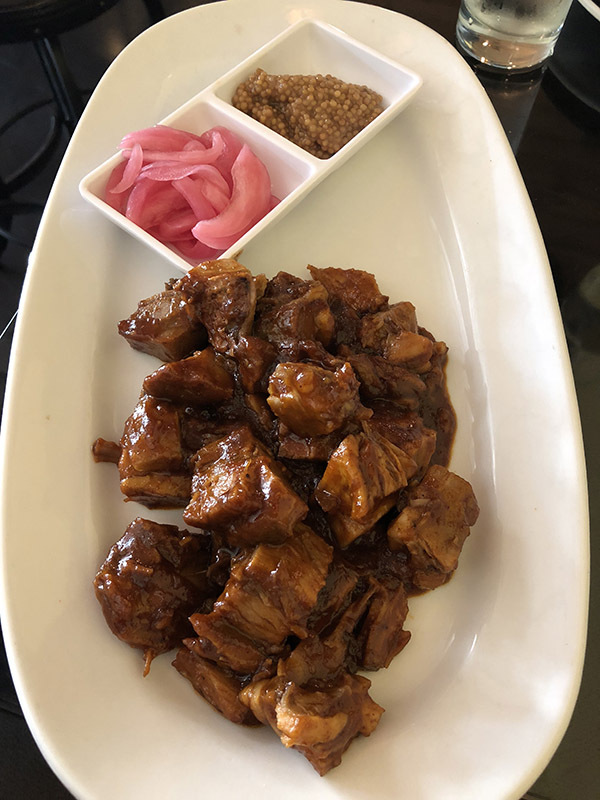 For the main course, I selected the 1/2 plate of Chopped Pork. It comes with pickled onions and mustard on the side. I ordered a glass of rosé to pair with the pork. 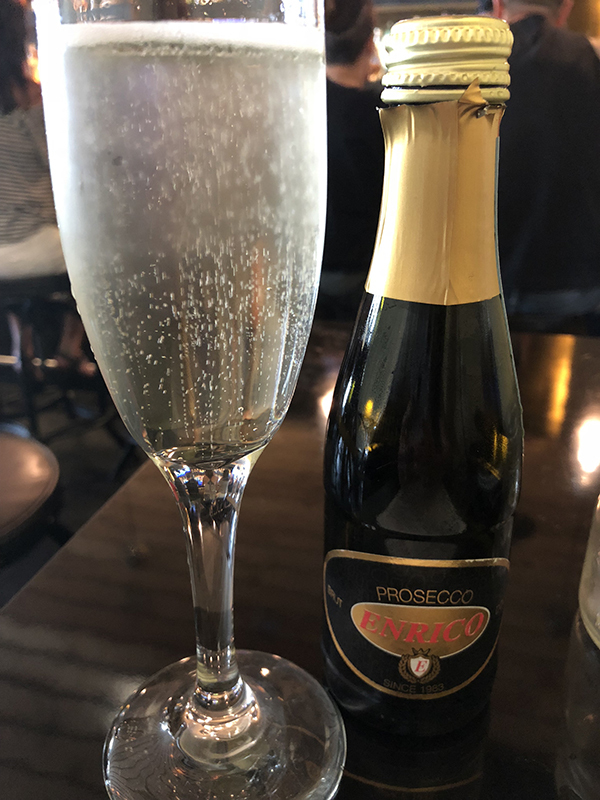 I could have gone a little heavier on the wine, especially because of the sauce on the meat, but in the heat of summer, I am hardwired to order bubbles or rose, no matter what the protein or the “traditional” pairing. 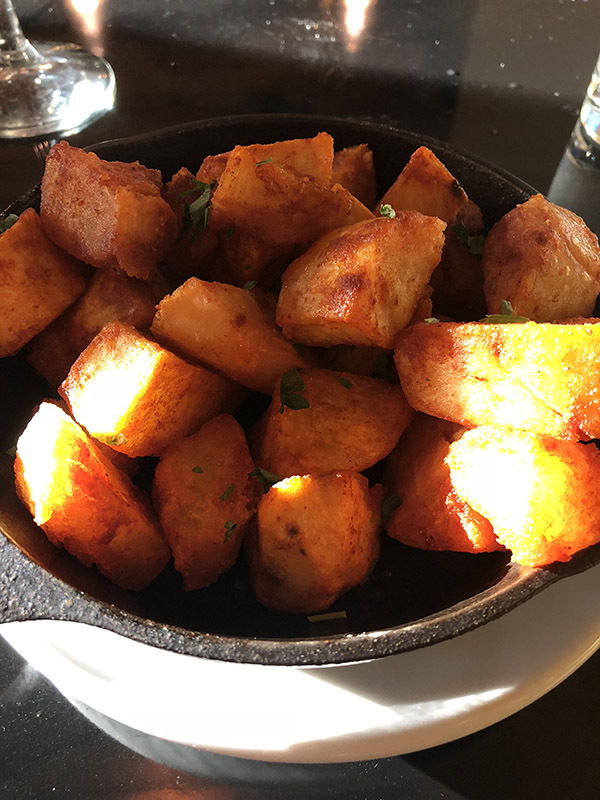 I guess you could say I ordered these potatoes for “dessert” and an excuse to try one more dish. Crispy little potato nuggets. This is where the aforementioned BBQ sauces come in. I tried them all on the potatoes and it turns out the middle “Starlite BBQ” is my favorite. I wish my husband had been with me so I could have sampled a little bit more of the menu items. Instead, I was already taking half of the meal back to the hotel in boxes, which was great because it made for the next night’s dinner. In other words, the portions are large and perfect for sharing. 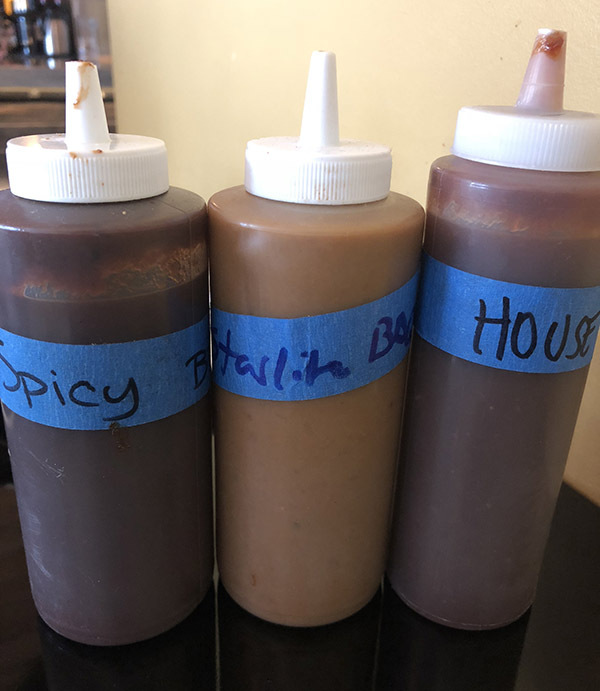 Also good to know: Starlite BBQ supports local organizations and uses local vendors, such as Arizona Beef, organic produce from McClendon’s Farm, fresh breads daily from MJ Bread, and local pecan and mesquite woods to smoke their meats. Starlite BBQ and Whiskey Bar is located at 7620 E Indian School Road Suite 101, Scottsdale, AZ 85251. You can contact them at 480-553-9330. They are closed on Monday and Tuesday, and open Wednesday and Thursday from 4pm-11pm, on Friday from 4pm-midnight. 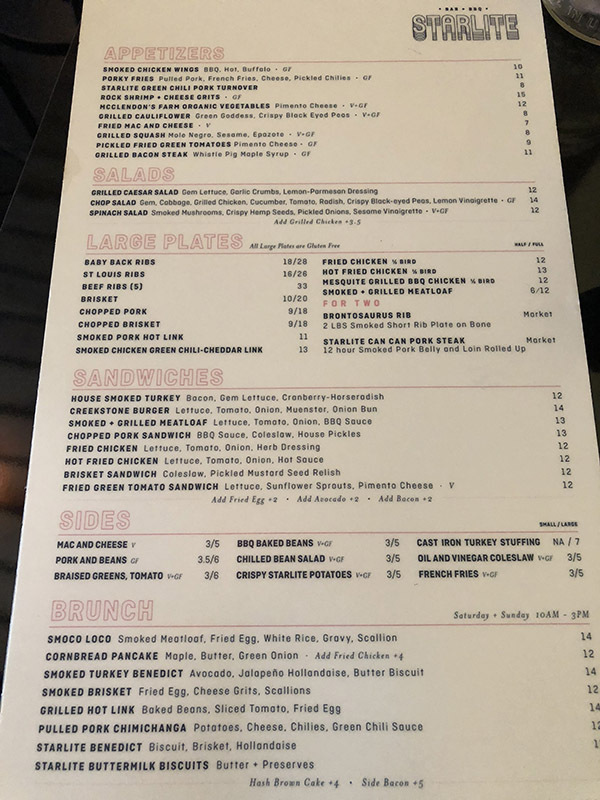 They are also open on Saturday for Brunch and Regular Menu 10am-midnight and on Sunday for Brunch and Regular Menu 10am-10pm. The bar is open until 12 Midnight on Wednesday and Thursday, until 2 AM Friday and Saturday and 12 Midnight on Sunday. You can find Starlite BBQ on Facebook here and follow them on Instagram here. 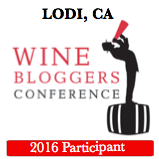 Disclosure: My meal was complimentary in exchange for social media exposure and this blog post, however my opinions are all my own.